Retail giant Shinsegae Group’s duty-free operator Shinsegae Duty Free said Thursday that it has partnered with UnionPay to attract more Chinese travelers and provide an easier payment option. UnionPay, a Chinese financial services company established in 2002, is a major bank card service provider in mainland China. As of last year, up to 16,000 trillion won ($14 trillion) of transactions were made through UnionPay. The UnionPay app, which allows users to pay via QR codes, currently has an accumulated 70 million users, according to the Chinese firm. 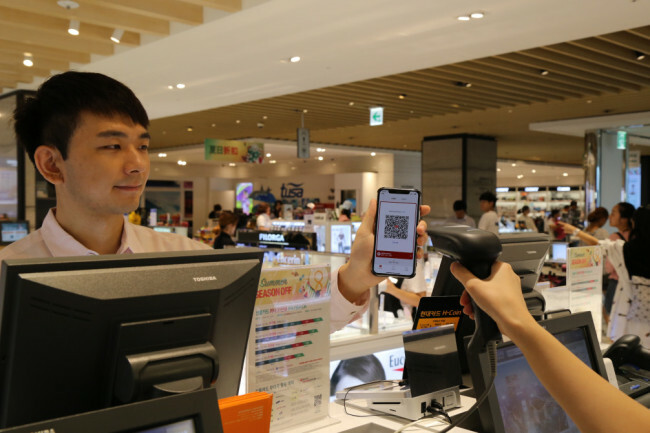 Under the partnership, Shinsegae Duty Free accepts payments via UnionPay’s QR codes at all its stores from Thursday, the firm said. It is the first attempt for the Korean duty-free operator to introduce UnionPay’s QR code payment here. As UnionPay is a common payment method used by Chinese travelers, the convenient and easy digital payment is expected to help Shinsegae Duty Free secure a wide range of customers, the company said. “We are reviewing various payment methods to suit Chinese travelers’ specific needs, and ultimately create a convenient traveling environment for Chinese tourists,” said an official from Shinsegae Duty Free.